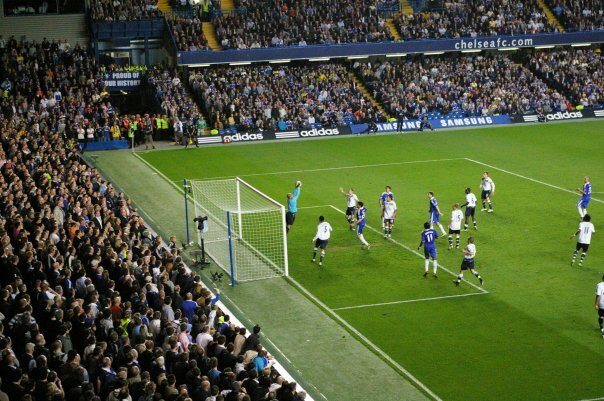 Chelsea vs. Everton : 22 April 2009. My mates always commend me on my memory, but I think I will have trouble remembering too much from this game in a few weeks, let alone a few years. Is this the game our league hopes were extinguished? I think so. Let’s get the black armbands out. I had a call from Parky during the day to say that Les from Melksham wanted a lift, too, and would I oblige? The more the merrier, in my book. I don’t know Les too well, but I happened to be stood next to him in Turin a few weeks ago…he, like Parky, has been going to Chelsea for ages and has a season ticket about thirty seats away from me. Les is “Class A Old School”, with many misdemeanors from the good old bad old days to his name. I left work bang on 4pm, after manipulating some work into Thursday ( priorities! ), and I made great time up the M4. I amazed myself – I was parked up at 6pm and we were soon charging through The Goose to meet the rest of the boys in the sunny beer garden. I had forgotten that this game was to kick-off at 8pm, so we had a good ninety minutes of banter ( we didn’t change ends at half-time ) before we needed to leave at 7.30pm. I squeezed in three pints, but it left me a bit weary at the end of it all. 1. At the end of our little pub crawl, we were all buzzing – some more than others. It was a brilliant pre-match. 2. Claire really enjoyed herself – her first game since the Liverpool crunch game in 2003. 3. We are all happy to pay a cheaper price for the FA Cup Final – the view in the Lower Tier won’t be worth £90 plus. 4. Everton were by far the noisiest of the four semi-final teams over the weekend. They will out sing us at Wembley, no doubt. 5. I made the point that Everton are at an advantage because the fans only know three songs. 6. Rob made the point that we were singing three songs at the same time on Saturday. 7. The Lower Tier was being targeted by the CSG and CFCUK as the “dedicated singing section” on Saturday – we must do better! 8. We are getting Bada Bing “leisurewear” for Neil’s wedding ( reception ) in Guernsey in the summer – you have been warned. 9. Daryl has spent untold amounts of £££ on match tickets for himself and Ed the past four weeks. 10. Ed’s repayment is to be the dedicated beer collector once we are drinking. He knows his place! 11. We are annoyed that for the second year running, should we reach Rome, the other team will be a day ahead of us in booking all of the cheap flights and hotels. 12. Should we get a favourable result in Barca, a few of us might “gamble” on flights to Rome. 13. Simon confirmed that his son Milo, eleven, has been to about 35 games this season and will mysteriously fall ill should we get to Rome. I hope his teachers don’t read this. 14. Glenn was the wobbliest of all of us on Saturday – by a mile. 15. Russ – from Frome, now Croydon – had just got back from four weeks in Oz and is seriously considering Rome. Watch this space. 16. Lovejoy was absent, but was with his lady friend in La Reserve…five minutes of Lovejoy stories followed with much laughter from all. 17. Alan spoke of “the meet” for West Ham and hoped that those Americans coming ( you know who you are ) realise we will be behind enemy lines. No colours, no girly shrieks – especially from you, Bob! 18. Season tickets for next season were discussed, with the conclusion that a ) we can’t afford them and b ) we will get them regardless. 19. Provisional plans for gigs coming up over the next month were discussed – The Specials, Morrissey, Depeche Mode. It’s not just the football that keeps us as mates. 20. Parky – get the beers in! It was such a pleasant Spring evening in that packed beer garden, full of friends and acquaintances built up over the years, that we could have stayed there all night. I am sure as the years progress, our departure time will get later still. Parky and myself trotted down the North End Road and, without trying, got rid of Parky’s spare ticket. In to the ground at 7.57pm – perfect timing. The programme had a fantastic shot of Alex, just after the point of impact of his shot which crashed into the goal against Liverpool…veins pumping, muscles taught, legs fully extended. I took a shot, a split second after, in fact. We half-expected there to be empty seats in the away section, but they filled their 1,400. Credit to them. Despite going to about ten games with Lord Parky this season, I was sat next to him for the first time – he was in Glenn’s seat. I chatted with Tom, thankfully having no ill effects from last week’s health scare. Everton harried and chased all night long and tested Cech on a few occasions, especially in the first half. I remember a Ballack free-kick which went quite close for us. But, not a great performance at all. Meanwhile, United were 1-0 up at home to Pompey. Groan. Cech was our best player, I reckon…nobody else stood out really, although Malouda wasn’t too bad, following on from his best two games in our shirt. Alan asked me who would be my Player Of The Year. I said “Frank – by a mile.” Mikel began the season well, but has faded. What do others think? It was pretty quiet for most of the night. I wondered how Beth was doing in The Shed – hopefully not falling out with a few “day trippers” like during her last visit. What a run from JT – with the whole MH shouting “shoot!” – he let fly and forced a save from Tim Howard. Kalou got behind the defence a few times but this was one of those games, I am afraid. That dynamic shot from Drogba on about 93 minutes just about summed it all up. What a difference from eight days ago against Everton’s city neighbours. Phil Neville got his usual customary, friendly welcome. West Ham next – with Gary, Alan, Daryl, Ed, Andy, Ashley and Parky ( plus honoured guests from CIA Land ). Oh, and a mammoth report about Chelsea vs. Leeds United from 1984. This entry was posted in Season 2008-2009. and tagged 2008-2009, Everton, The Bing by Chris Axon. Bookmark the permalink.